Aubert-Mirecourt-Made in France---Figured Select Maple--Quality Violin Bridge Full Size 4/4, Feet Span 42mm. Teller Model--Quality 3 Star Violin Bridge with Ebony Insert--Violin full size 4/4. Teller--Made in Germany--Quality Bridge with Self Adjusting Feet--Height High--to be cut down to size needed to fit instrument---same bridge as # 262 only higher. Violin Full size 4/4. Teller One Star Bridge-Germany. Violin Sizes: 1/8, 1/4, 1/2, 3/4 and Full Size 4/4/ Please indicate size when ordering. Violin Bridge Full Size 4/4--French Style Bridge, old figured Bosnian maple, made in Germany. Stannton Stand Up Bass Bridge--Maple--Size 3/4-or-1/2---Must be fitted to instrument. Please indicate size when ordering. Same as Item # 5530B--only for 1/2 Size Stand Up Bass--- Good quality--3 Star Teller--Made in Germany. Very Good Stand Up Bass Bridge Size 3/4. Quality Bosian Maple-- 3 Star Teller--Made in Germany. One Star Teller--Made in Germany--Sizes: 1/8, 1/4, 1/2, 3/4, or 4/4. Tourte model--Violin Full Size: 4/4--Made in Germany. Good Quality Teller Model, ebony across top, 3 star. Size: 4/4. Made in Germany--On sale till end of stock. Made in Germany--Master Model--Violin Full Size 4/4. Baroque Style Violin Bridge--Full Size 4/4--feet width 41 mm. Bakelite Material--Dresden Style--Violin Sizes: 1/8, 1/4, 1/2, 3/4, and full Size 4/4. Violin Full Size 4/4--Guarnerius Style-over the tail piece Chinrest--Composition Material. Nice tailpiece. Bakelite Material-Leipzig Style-Violin Full Size 4/4. Bakelite Material-- Mulco Style--Violin Full Size 4/4. Bakelite Material--Tekka Style---Violin Full Size 4/4. Bakelite Material--Wendling Style--Over the Tailpiece--Violin Full Size 4/4. No 1203--Dresden Style--Tamarind Wood--(Rosewood Replacement)-- Violin 4/4- We now have these in stock--Beautiful Wood--much like Rosewood. Left Handed--Ebony--Dresden Style--Violin Size 4/4. 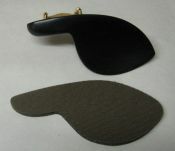 Very comfortable Pad and easy to install, simply remove protective paper from back of pad and place on chinrest. It can be easily removed for correction or transfer without leaving any glue residue and also may be trimmed for smaller size chinrest. Note Chinrest in photo not included. Very comfortable and easy to install, remove protective backing and place on Chinrest. It can be transferred without leaving any glue residue. 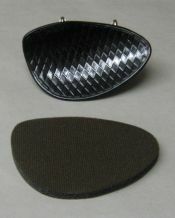 This pad is for a Guarnerius Style full size violin rest, however maybe trimmed for smaller size if needed. Note Chinrest shown in photo not included. Hill Chin Rest Brackets, Silver colored , Violin 4/4--Full Size..Sold each..Need 2 for a set for one chinrest. Hill Style Chinrest Brackets, Gold Colored--Violin full size 4/4. Sold Each. Need 2 for a set for one chinrest. Dresden Style Chinrest, Ebony, Silver colored hardware--Violin full size 4/4. Guarneri model, large plate, ebony, silver colored hardware. Size 4/4....WE ARE OVER STOCKED ON THIS ITEM---ON SALE TO REDUCE INVENTORY. Guarneri model, same as chinrest No.1205 but with gold colored hardware. Size 4/4. Guarneri model, large plate, boxwood, silver colored hardware. Size 4/4. Same as chinrest No.1208 but with gold colored hardware. Size 4/4. Chinrest Bracket-Silver colored--Sizes: Violin size 3/4 or 4/4. Chinrest Bracket--Gold Colored--Violin full size 4/4. Violin End Pin--Tamarind Wood --Regular Style--Rosewood Replacement--Now in stock-Beautiful Wood. Ebony, B-- Quality----Maybe be some lighter lines in the wood--However, Still Ebony. Made in India-- Size Violin 1/4, 1/2, 3/4, 4/4. Ebony, A quality. Violin Size -- 4/4. Made in Germany--Please note: All--- Fingerboards needs to be fitted and fine sanding to finish, then you may use olive oil for polishing. Ebony Fingerboard-Made in Germany-----Viola full size-- All fingerboards must be fitted, Sanding required. Rosewood Saddle--Violin--Shipping with in Canada only--New Restrictions on Rosewood products. Rosewood Fingerboard Nut--Violin--Shipping within Canada only--New restrictions on Rosewood items. Silver Color Violin String Adjuster with Rubber Protector--Protects top of violin. Violin Full Size 4/4. Wittner-Germany: String adjuster--Gilded (Gold Color) --Violin Full Size 4/4. Large rubber. 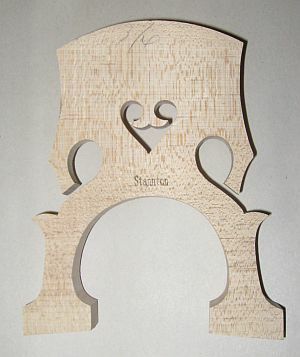 Size Violin 1/2, 3/4 or 4/4. Wire style, slides on strings. One size. Cello sound post--must be fitted. Ebony--Violin--Fingerboard Nut--As with all parts, must be fitted. Threaded nylon with two brass nuts. Violin Sizes: 1/4, 1/2, 3/4, or 4/4. Made in Germany---Wittner String Adjuster for tailpiece--Silver colored Sizes: 1/4, 1/2, 3/4, 4/4. Please indicate size when ordering. Whittner-Germany--String-adjusting screw--Black Colored--Violin Size 1/4, 1/2, 3/4, 4/4. German Made by Wittner: String Adjuster--Black with gold adjustment screw. Violin Size: 4/4. Violin Peg--Tamarind Wood--Rosewood Replacement---9mm--French Model--SET OF 4 PEGS $11,00----NOW IN STOCK---Rosewood Replacement---Beautiful Wood. W.E.Hill, A peg Composition for Pegs which have ceased to run smoothly. No 508C Joha Peg Lube is out of stock--therefore we offer No 506C Hill Peg Paste at the same Price. Made in Germany: Joha Peg Lubricant--large size. SORRY OUT OF STOCK--Please do not order. Medium size Shaft 9mm--4/4 size--Swiss style, Polished ebony. Violin Sizes 1/4, 1/2, 3/4 or 4/4. Hill model, boxwood, black pin and collar. Medium size shaft--9mm--Violin Size 4/4. Price each. Purchase set of 4 Pegs @ $18.00---SORRY SOLD OUT--NEW STOCK ON ORDER--PLEASE DO NOT ORDER AT THIS TIME. Boxwood Violin Tailpiece--Violin Full Size 4/4. Regular Round Style. Wittner-Germany--Violin 5 String Tailpiece-- Black- Ultra Light--Ultra Strong--Composite Material--with built in String Adjusters--Violin full size 4/4. Ebony, Finest quality. Violin Size 1/4, 1/2, 3/4, 4/4. Regular Round Style. Hill model, Ebony with gold fret. Size 4/4. Hill model, Boxwood with Ebony Fret. Size 4/4. Ebony, polished, inlaid Parisian eye. Size 4/4. Black Aircraft Alloy with built in fine tuners. Sizes: 1/2, 3/4 or 4/4. Good seller & Good Quality. Please indicate size when ordering. Wittner--Germany-- Ultra Model, High-Tech--Composite Material--Ultra Strong--With Tailgut Black with built in gold colored string adjusters.--Violin Size 4/4. Wittner--Germany: Violin Tailpiece-- High-Tech composite material-Ultra Strong--Ultra Light--Black colored with built in string adjusters. Violin Size 4/4.